In the 13th-century, western Europe rediscovered Aristotle's books on natural philosophy, or natural science ('Libri naturales'), and this caused an intellectual revolution. Despite being banned in Paris early in the century, they quickly became part of the curricula of universities. 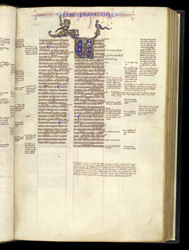 Oxford, where this manuscript was probably made, was a leading centre for the study of Aristotle. All students had to read set texts of Aristotle's treatises with commentary, of which this book is an example. It is exceptional, though, because it is quite richly decorated with unusual images. Furthermore, it belonged to Nicholas of Cusa, a German theologian and cardinal, in the 15th century. The historiated initial (first letter bearing a picture) of Section Eight of 'Physics', the book considered essential to study of nature, shows how the ideas in Aristotle's natural science were 'tweaked' in order to put them into a Christian view. In this section Aristotle states that motion is eternal and continuous and that an unmoving and unmovable 'first mover' existed on the edge of the universe. The last part was easily assimilated to Christian views: the 'first mover' is God, the Creator. The first bit was harder because it contradicted the Christian doctrine that the world began at a point in time. The picture ignores that and shows Christ holding a medieval globe, in which the world has three physical parts (Asia, Africa, Europe). The gap Aristotle opened up, however, was just beginning to cause trouble when this manuscript was made.